If you want a great event for kids or grandkids, or, if you want an innovative dinner party idea, this is it – Make Your Own Pizza (The Thincrust Version). In a previous post, we showed how to make some great homemade pizzas, using whole-wheat flour and a relatively thick crust. Recently, we’ve tried a wonderful thin crust version, first with some of the grandkids and then for a dinner party of eight adults. Everyone got involved and we had a great time. I asked myself if we really wanted to do another post on pizza, but then I realized how silly that was. You can’t spend too much time on pizza. Many of us feel that pizza (and butter) should be on the base of the Food Pyramid (or do they have that anymore??) The dough recipe and some of the topping suggestions come from Priscilla, a good friend who has made thin crust pizza every Friday night for years. With the ingredients below, you can introduce everyone not only to some of the great classics (cheese and sausage, true margarita), but also some new twists (arugula topping, pesto and shrimp). If you want to make thin crust pizza, you need three things: a pizza stone, a paddle and some corn meal. With thick crust pizza, you can par-bake the crust, add the ingredients and throw it back into the oven directly on the rack. Unless you have really heaped stuff on top, nothing should boil over and drip. This does not work with thin crust – it is too delicate. A good paddle costs a little money, but you’re only buying one and it will last a lifetime, so get a good one. Make sure that it is at least 14” wide. Many are only 12” and you will be very disappointed if you end up with one of these. I was thinking of some analogies, but I won’t go there. I have the Epicurean 14”x21” with silicone grip handle (about $40 at Amazon and rated 5 stars) and it is perfect. 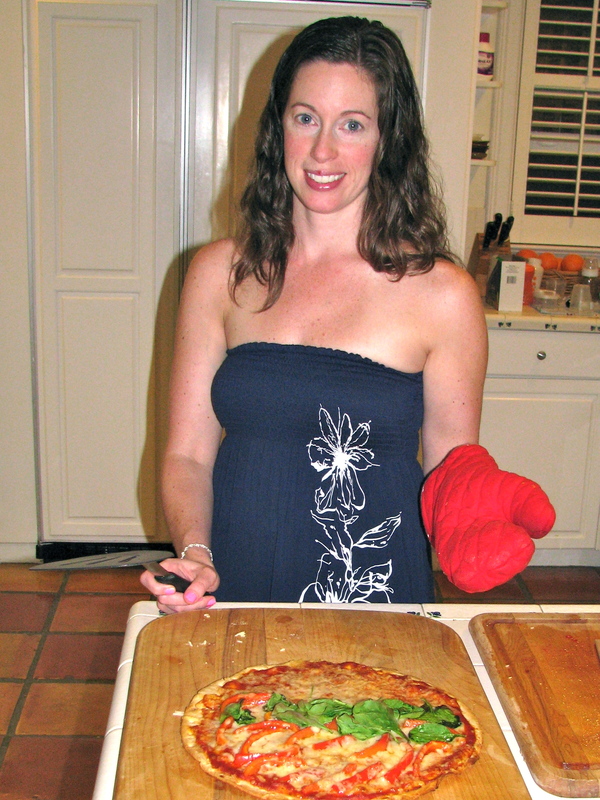 A good pizza stone should be 15”-16” in diameter – no smaller. These are available for about $30. I like the plain ceramic stone with no handles – the handles seem to get in the way. The stones are an unglazed ceramic and they can break easily so you need to treat them with care. They also get a very used look after a while, as you can see in the picture of my stone. Corn meal is your final “tool”. Without it, you will never, never be able to go from paddle to stone. Corn meal is like tiny ball bearings that help things slide but don’t burn up in the oven. You can buy a one-pound bag for about $1.00. Put it in a zip-lock bag and you will have enough for 10 years. There are two types of wheat – hard and soft. Those euphemistic descriptors actually refer to gluten protein content, not hardness. Hard wheat has more gluten (about 13%), soft wheat has substantially less (about 8%). All Purpose flour has a mixture of hard and soft wheat. Bread flour is made of all hard wheat and therefore has the most gluten. We like to have more gluten for yeast breads. The chemical reaction between gluten and water forms a complex mesh of long molecular strands throughout a yeast bread dough like pizza. This molecular mesh is the key to trapping the carbon dioxide produced by yeast, thus causing bread to “rise”. While you will probably be perfectly happy with bread flour, the Italians think that you need a more finely ground flour to make really good pizza. Bread flour is relatively finely ground, but the Italian “00” flour is even finer. Most of the good pizzerias follow the Italian lead and you can splurge with some true Italian Antimo Caputo “00” flour – available on Amazon. Mix the salt and the flour together. Make a well in the flour and add olive oil. Stir in thewater with yeast. Put some flour on your hands and pick the dough up and knead for 5-7 minutes until it becomes elastic and smooth. Line a deep bowl with a thin film of olive oil; roll the dough ball around so it is lightly coated with the oil, cover and let rise for 2-4 hours. Suggested ingredients for toppings: Below is a suggested list for a magical dinner party. Add whatever else you wish. Pineapple is popular in Hawaii. Put the pizza stone into the oven and heat to 450 degrees. The stone needs at least one hour to heat properly. DON’T FORGET TO DO THIS AHEAD OF TIME! Prepare all of the ingredients ahead of time and place in small bowls. As shown below, some of the ingredients need to be cooked. You can do this while the stone is heating. Slice the tomatoes as thinly as humanly possible and put the slices between paper towels to get rid of as much moisture as possible. Make sure the shrimp is cooked (buy it that way or do it yourself). Cut each shrimp into three pieces. Cook the mushrooms and peppers, draining off any liquid and drying with paper towels. Keep the arugula in a separate bowl; add about a tablespoon of olive oil and toss. Make sure the oven is turned on and the pizza stone is in the oven. If you have forgotten this step (as you will do someday), quickly open a bottle of wine and regroup. You have at least 45 minutes to kill. Take the dough balls out of the refrigerator and let them sit and warm for about 15 minutes. 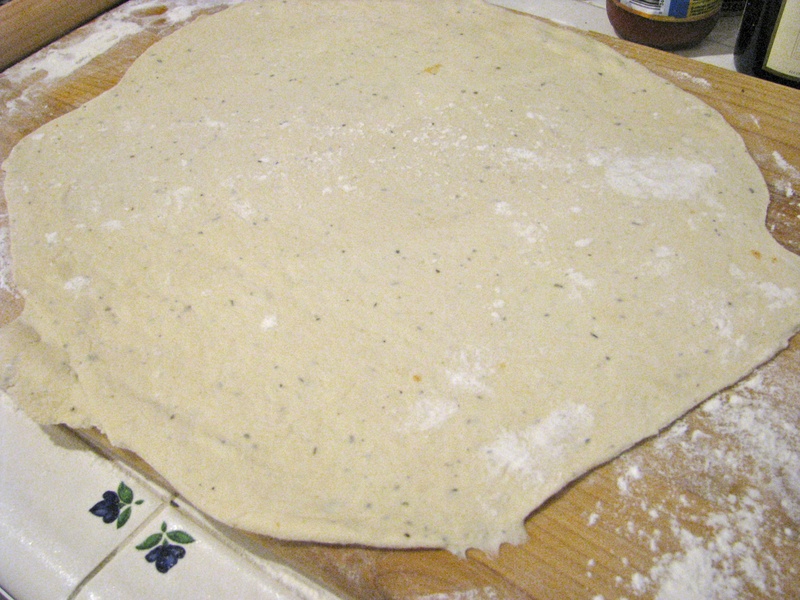 Roll out the dough on a floured surface into about a 12”-14” diameter. For some reason the dough is often a little rubbery, but take your time and all will be well. 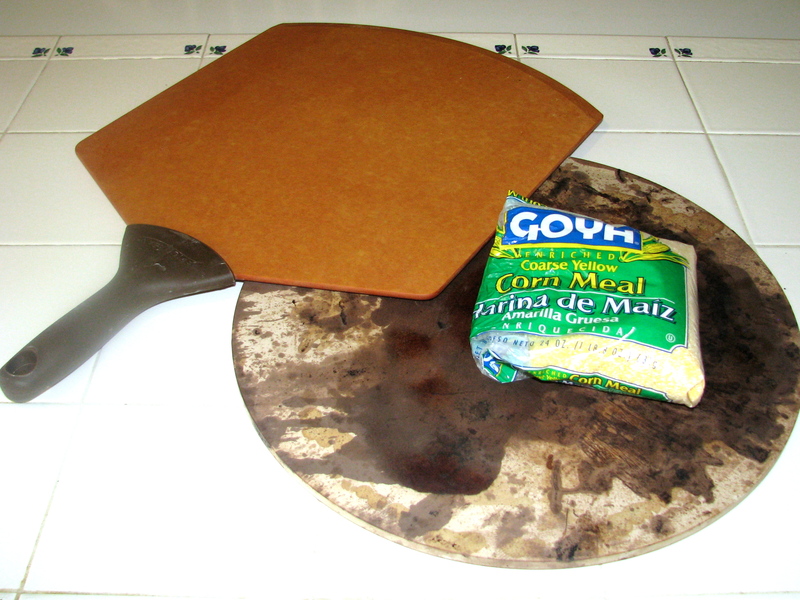 Put some corn meal on the paddle and transfer the dough to the paddle. DON’T FORGET THE CORN MEAL. Spread a little olive oil on the top with you hand and punch some holes in the crust with a fork. Open the oven and slide the crust onto the pizza stone for 3 minutes. This will “proof” the crust and make handling easier. Leaving the proofed crust on the paddle, start adding ingredients. If using tomato sauce as a base, use a pastry brush to paint the dough first with a very light coat of olive oil, and then add the tomato sauce. If you are using a pesto sauce as a base, you don’t need to add additional olive oil. Add whatever other ingredients you wish, making sure that the cheese is added last. You can use the sliced tomatoes instead of the pizza sauce. When finished, open the oven and slide onto the pizza stone. Bake for 9 minutes or until the crust is a golden brown; remove with the paddle and set on a cutting board to cool about 3 minutes before cutting and serving. Start things off with a classic cheese and sausage. You paint the dough first with olive oil, then dump 3-4 Tbsp of tomato sauce in the middle and spread evenly. Next, add a generous amount of sausage and top with the shredded mozzarella cheese. Arugula with a little olive oil is a surprisingly great topping for any pizza. Try doing the Margarita pizza in the classic way. Paint with olive oil and then line the top with thin slices of tomato, followed by five or six slices of fresh mozzarella. Top it off with a little shredded mozzarella and some basil leaves. Pesto and gorgonzola go very well together. Paint the dough with a thin layer of pesto sauce, add a few pieces of crumbled gorgonzola and top with a little shredded mozzarella. Pesto and shrimp topped with arugula wil be a real hit. My granddaughter loves black olives. She made a black olive and cheese pizza and used the entire can of olives. It was surprisingly good. Have fun and let me know what new combinations you come up with. I have so many pizza pictures that I thought a slideshow might be in order for those hungry for more.